It was nice to dive into a fiction book once again, that book being The Confession from one of my favourite fiction writers, John Grisham. His last two works have been shorter – Ford County with my review here and Theodore Boone with my review here. 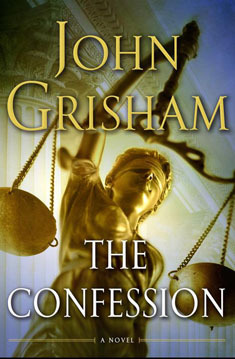 But with his new work, Grisham returned to his normal length, crime-suspense novel of 400+ pages. I chose to read it on my iPod Touch through the Kindle application. A few months back, I had attempted to read a more theological work from my iPod Touch (N.T. Wright’s Surprised by Hope) and it was not a pleasant experience. I didn’t enjoy it because I was not used to the idea of taking notes via the Kindle app, not to mention that the endnote numbers did not have hyperlinks. So I went ahead and bought a paper copy of that book (I still enjoy paper copies). But reading a fiction book through my iPod Touch was more preferable, as there was no need to take notes. I will go ahead and say from the beginning that I greatly enjoyed the book. But I have now read all 25 of his works, so you can imagine I am a fan of Grisham (I’ve mentioned it a few times on my blog). I don’t believe all of Grisham’s books have been top notch, but, for me, this was truly one of his better novels. It was interesting that the main character, Keith Schroeder, was a Lutheran pastor. It is my understanding that Grisham is a Christian (see this article by Ben Witherington), and such has come through before in works of his like The Testament. So there was definitely a lot of Christian overtones in the book via not only the main character, but many of the characters (with much of it being southern American Christianity, especially noting a lot of the novel took place in a major part of the Bible-belt, Texas). Another interesting feature, at least for me, though I don’t want to give away too much, is that the book did not carry the everything-is-gonna-be-okay-perfect-ending. But I appreciate that characteristic in this book, as life doesn’t always bring such perfection. Of course, for the believer, we are assured that God is working all things together for good for His people (Rom 8:28) and He will right all wrongs in the age to come. But in this age, as we are still part of the ‘present evil age’ (Gal 1:4), we have trials and tribulations, disappointments and disillusionment, pain and hurt to deal with, some of these being extremely deep. I think it important to remember that aspect. Not in a defeatest, depressing sense. But remembering such with seasoned wisdom. So I truly enjoyed the read and would recommend this book to those who love fiction and especially fiction of the crime-suspense genre. This entry was tagged book review, books, fiction books, John Grisham. Bookmark the permalink.